Just finished another batch of products! 1. Lush American Cream hair conditioner: This was not moisturising enough for my color-treated hair. Fortunately, this was just a small 100ml bottle that lasted about 10 uses for me. 2. Lancome Bi-Facil Eye Makeup Remover: Many ladies swear by this dual-phase non-oil eye makeup remover but it was not able to remove some waterproof mascaras completely for me. 3. Urban Decay Clean & Sober Oil-Free Makeup Remover: I received this as a GWP when Urban Decay was launched in Singapore earlier this year. One bottle lasted just over one month with daily use. I usually use three pumps on a cotton pad. It does remove foundation and other face makeup quite effectively but I still follow up with a foaming cleanser to make sure that I cleanse thoroughly. I tried using it to remove eye makeup but it stung my eyes and was not able to remove some waterproof mascaras completely. 4. DDF Sulfur Therapeutic Mask: I liked how this mask left my skin feeling very soft and clean. It dries quite fast in Singapore's weather and was easy to wash off. It did not completely prevent acne for me but still, I liked it. Despite containing sulfur, it does not have any odious sulfur smell. 5. John Masters Organics Zinc & Sage Shampoo with conditioner: The first time I used this, it kept reminding me of some dessert. It took a few washes before I realised that it smells like pulut hitam, which is a black glutinous rice dessert with coconut milk! It cleanses well but leaves my hair tangled and still in need of a heavy duty conditioner. I wouldn't re-purchase as the current Sala shampoo that I'm using leaves my hair soft and tangle-free even without conditioner. 6. Paul Mitchell Super Skinny Relaxing Balm: This worked quite well to keep my hair neat and tame stray flyaways but wasn't really anything special. 7. Giorgio Armani Acqua di Gio eau de parfum: This Mediterranean-inspired fragrance has notes of mint, calabrian lemon, brown sugar and Sicilian cedar. I found the mint note to be a bit too strong and clinical. 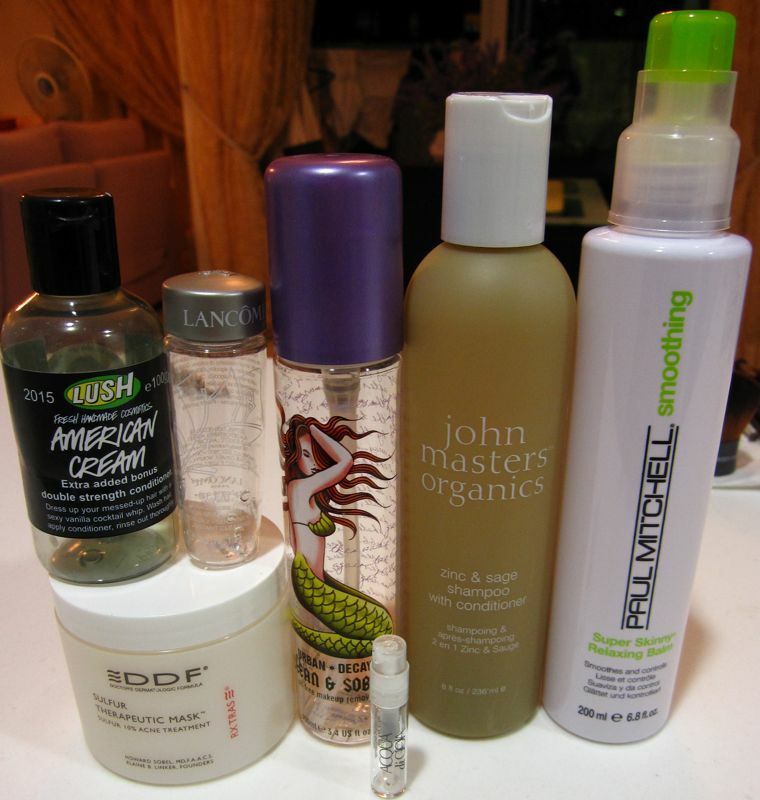 The zinc n sage shampoo is one of my fav hair products. Feels it cleanse my scalp really well. I use it once or twice a week. I did a cleanup the other day and threw away empty bottles and stuff that no longer felt fresh enough to use. Good to get some room for new stuff. I received the Paul Mitchell product as a free gift with a magazine purchase last year at Kinokuniya so I'm afraid I don't know where it is sold in Singapore.